TMP style heated platen presses can be supplied for compression, transfer or vacuum molding with either electrical heating up to 1200 °F, hot oil heating for advanced temperature uniformity or steam heating. Cooling options are also available. 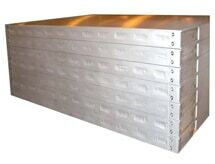 Custom and standard platen sizes are available, along with various press pressure ranges. Contact a French representative for more information on a TMP style heated platen press. TMP style Electrically Heated Platen Presses are uniquely designed to provide uniform heat distribution and temperature control, which is ideal for molding, bonding or lamination. Standard electrically heated platen presses heat to an operating temperature of 550 °F, though we can provide optional heating up to 1200 °F. Learn more about our Electrically Heated Platen Press. TMP style Oil Heated Platen Presses provide the most accurate and uniform temperature in your molding process. Oil heating is suitable for the entire range of composite and rubber molding, bonding and laminating applications. Oil heated platens offer controlled heating to an operating temperature of 750 °F. Learn more about our Oil Heated Platen Press. TMP style Steam Heated Platen Presses provide accurate temperatures for molding, particleboard, laminating and bonding. Platens are properly engineered and designed to match your existing or new steam source for heating up to 400 °F. Learn more about our Steam Heated Platen Press. 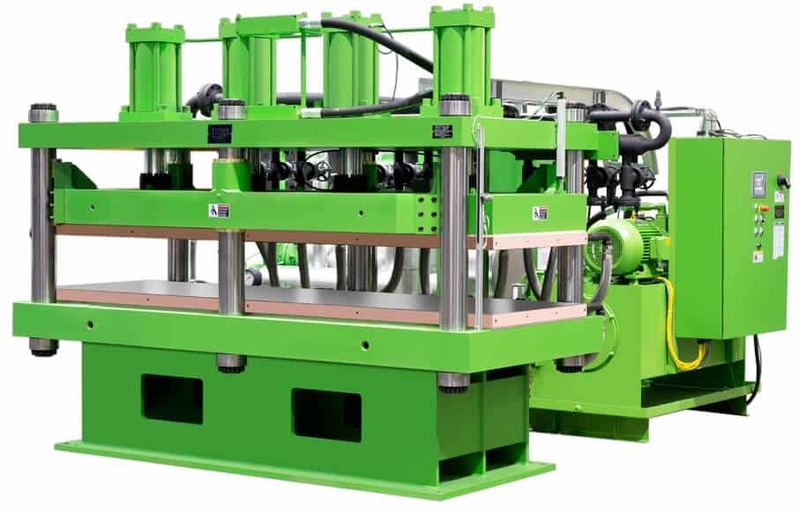 Platen Presses integrated with Isoplaten® heated platen technology deliver more uniform cure rates at optimum processing temperatures, decreased cycle times, reduced maintenance and lower energy costs in rubber molding. Learn more about our Platen Press with Isoplatens®. French Oil Mill Machinery Company owns the exclusive license from Acrolab for the manufacture and sale of Isoplatens® within the rubber molding and processing industry in North America. Isoplaten® is a registered trademark of Acrolab Ltd.
TMP recently designed two new slab side hydraulic presses for the bonding of friction materials used in heavy construction vehicles. 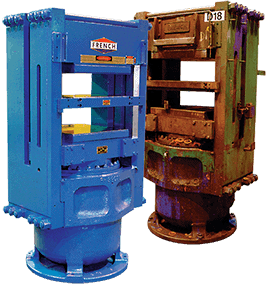 The low deflection press design was built in two sizes, a 1300-ton press with 56 inch square heated platens and a smaller 520-ton press with 36 inch square heated platens, both for heating up to 550°F. All areas of the new hydraulic press are under vacuum and accurate temperature control, including the automated charging system. The heated platens are equipped with three zones of electric temperature control, while the other sections of the system employ liquid temperature control.